Students at UP Academy Leonard listened to the inspiring stories of six panel members from around the Boston area in a special Black History Month celebration. The panel represented a diverse and talented group whose stories left a strong impression on the students. Many thanks to Oompa, Marvin Neal, Beyasmin Jimenez, Ive Sanchez, Edwin Johnson, and Adkeem Jackson for sharing your time and talents with our school community. See some photos from the event here. and Mr. Adler is the only winner from Massachusetts this year, the first ever from Lawrence Public Schools, and one of just 45 honorees nationwide this year. Congratulations to Mr. Adler and the entire community of amazing students, teachers, staff and families at UP Academy Leonard. Our staff had a great time working and playing with kids at the Lawrence Learns Party this past August 8, 2017. The UP Leonard School community got out to support their community and get some exercise in the recent Greenway 5K for Groundwork Lawrence. They had a great 5K team and enjoyed the route along the Spicket River Greenway that now ends at the new Ferrous Park near the UP Leonard campus. Way to stay healthy UP Leonard! This month the school hosted a Volunteer Day. Teachers, parents, and staff joined forces to make some beautiful changes to our school. Some changes included paining the stairs, fixing some doors, and adding these wonderful paws to the ground floor of the building. 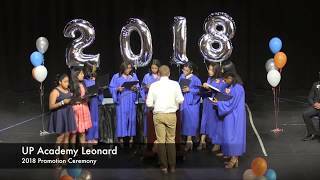 This is the 8th Grade Promotion Ceremony from the UP Academy Leonard in Lawrence, MA.